A few wins can make a big difference when it comes to championing the Dallas Cowboys in a network sitcom. The pilot for ABC’s Dallas-set Cristela, available for screening on the network’s media site since early last summer, found its title character steadfastly pledging allegiance to both the Cowboys and their starting quarterback. At the time that seemed like a fool’s errand. Now it’s perfectly timed to the team’s surprising 4-1 start to the season. Cristela’s sister, Daniela (Maria Canals-Barrera), dreams of her daughter becoming a Dallas Cowboys cheerleader. There’s a little slippage later in the premiere, when Cristela somewhat jokingly refers to Cowboys owner Jerry Jones as an “old buffoon” and a “demented geriatric” during an interview with her prospective law firm boss. But it all ends with the entire family watching a Cowboys game on TV and cheering wildly when they score. Your friendly content provider was of little faith when he brought up the Cowboys during Cristela’s mid-July interview session with TV critics. “It’s tough being a Dallas Cowboys fan right now,” Alonzo was told. “Why do you want to make me cry?” she rejoined. All of the Cowboys references have made it to the on-air version of Cristela, which premieres on Friday, Oct. 10th following Last Man Standing. Both comedies are old-line “multi-cams” filmed before a studio audience with laugh track sweeteners. ABC’s six other sitcoms, three of them new, are all “single cams” filmed without any audience input or giggle overlay. 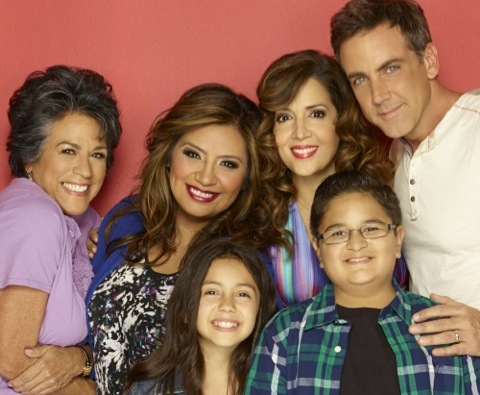 Cristela takes a broad approach in its depiction of a fractious Hispanic family and a workplace dominated by Anglos. Still struggling to finish law school, the title character lives at home with sister Daniela, her complaining husband, Felix (Carlos Ponce), and a typically stern mama named Natalia (Terri Hoyos). Most of her fire is aimed at Cristela, although mama’s not wild about cheerleading either. “If you were my husband, I’d drink it,” she says. Felix’s cousin and workmate, Alberto (standup comic Gabriel “Fluffy” Iglesias), also drops in and out to coarsely flirt with Cristela. The show is pretty much equally split between the home front and the workplace, where Cristela’s fellow law firm interns are a very nice Jewish guy named Josh (Andrew Leeds) and the boss’s ditzy blonde daughter, Maddie (Justine Lupe). She initially thinks Cristela is a member of the cleaning crew. Veteran Sam McMurray throws in a little ham-handed racial humor as a bossman named Trent. But Cristela rolls with him while also firing back with her own one-liners. Episode 2 is considerably weaker than the watchable premiere. It’s built around Cristela’s reluctance to date via the Internet and mama’s belief that she therefore could be a lesbian. Are we not yet beyond that kind of running joke? If Cristela has any staying power, it will be because of its high-appeal star. Alonzo seems like a natural in a show that intermittently amuses while giving the new fall schedule something it otherwise doesn’t have -- a comedy series driven by a Hispanic cast. That alone isn’t enough to earn any free passes. But it might prompt ABC to exercise a little more patience while continuing to invest in a lot more diversity than rivals CBS, NBC and Fox.